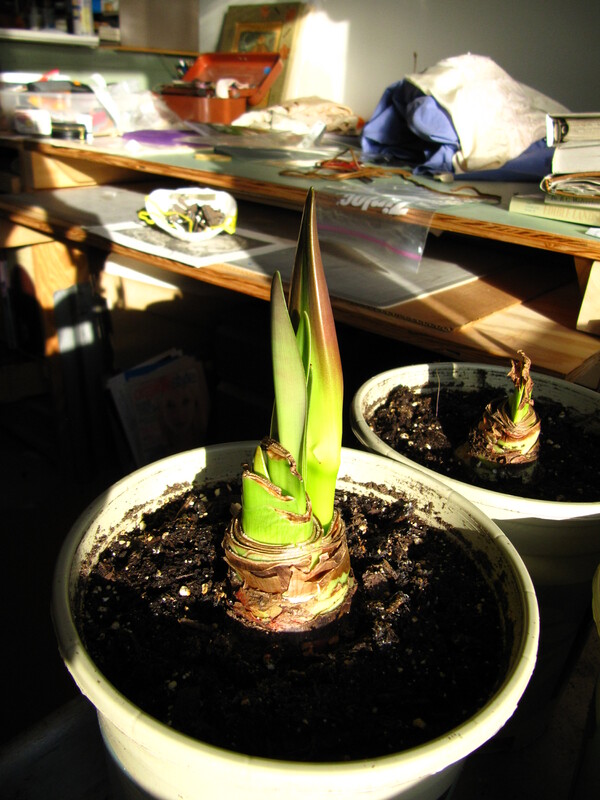 On this sunny but cold, glorious winter day the amaryllis in my studio continue to reach their first buds towards the light in the warmth of my wood-fired home. They are products of my latest endeavors. In October I quit a job that I’d had for ten years because of environmental illness. I’ll tell you now that this story has a happy ending. Like a growing number of humans all over the world, I am a canary. What this means is that I’m sensitive. Yup–there, I said it–I’m sensitive. I have to stress that this is not to say that I am overly sensitive or too sensitive. I see my affliction as both a blessing and a curse. The reactions us canaries have are often misunderstood. We are told that it’s all in our heads or told we just don’t like the smell of that heinous, designer perfume. It’s not all in our heads (though the reactions are so strange that one begins to feel a little crazy). A canary hates nothing more than to be called “too sensitive”. Since we are often reacting to something that is indeed toxic, we think that you’re simply not sensitive enough. My particular reactions happen to be to toxic chemicals. My body just seems determined to be the first to let everyone know they need to get the Hell out of the coal mine, RIGHT NOW. No, it’s not an allergy. I can’t take a Benadryl and make the symptoms go away. These are sensitivities, which means that if I take something that suppresses my immune system, my nervous system and my adrenal system freak out even more. Mind over matter? Nope, that adrenal system just plain takes over by amplifying my sense of smell or amping up the burning rash or the brain fog. The only solution is to remove the canary from the coal mine. Avoidance is far, far more complicated than you might realize. Everything you can think of is laced with toxic chemicals these days. No, for many products, the manufacturers do not need to let you know that there are toxins in their products. So, if you were thinking of purchasing that fancy new perfume from a well-known organization as a way to support the cure for breast cancer, think again. It contains chemicals that actually cause breast cancer. To help you understand the connection between beauty products and your health watch Annie Leonard’s “Story of Cosmetics” or go to Fran Drescher’s website, Cancer Schmancer. If you’re lucky enough to hang out with a canary though, have no fear, you’ll know exactly which products are safe. Of course conventional allopathic medicine doesn’t really understand or recognize sensitivities. Unfortunately, there are many, many canaries out there being treated for allergies instead of sensitivities. I’m “fortunate” enough to not have healthcare so I missed that boat. I’m also fortunate to have cultivated an awareness of myself that allows me to see how my environment affects me. Hopefully these canaries begin to notice that the conventional treatment isn’t working and that they need to see a doctor who specializes in environmental illnesses. Not having access to such a doctor, it took me years to begin to make the connections between chemicals and mold and the weird symptoms I was having. The key was realizing that I was not having an allergic reaction: that what was happening to me had to do with my nervous system. Unable to see the appropriate doctor, I hold myself together with diet and exercise and by avoiding, of all things: other humans. And…I fantasize that in some long-gone, prehistoric, social system, I was a prized member of the clan for my ability to sense danger. I also fantasize that I someday find employment as an intuitive, environmental specialist who can sense within minutes–without a bunch of expensive tests–that a building or product is safe for humans or not. So…I quit my job. Did I have another job lined up? Nope. I had two choices: Make money at the expense of my health or try to save my health at the expense of making money. I agonized for years–yes, years–over this decision as my health continually declined (and as I watched the health of my unwitting coworkers decline) and my sensitivities to chemicals got worse and worse. Either way, whether I went to work or quit, I was taking a leap of faith. So I decided my health was more important than money. No, my employer would not accommodate me by removing me from what I believe was a mold-filled building. No, when asked to quit wearing synthetic fragrances, my coworkers continued to contaminate the air we all had to breathe. Yes, I’d worked for the same employer for 10 years and they knew when they moved our department from one building to another that I was suddenly sick. I never get sick. NEVER. It was tremendously humiliating for me when I began to have to call in sick to work because the perfume my coworkers wore made me sick for days on end. It was also tremendously humiliating to have to wear a facemask to the office. Yes, I’m beginning to heal, but I still cannot spend more than a few minutes in a room full of chemical-laden humans without getting tremendously sick. However, In this season where all things are going dormant, I’m finding new life in new endeavors. I’m finding room to grow. If only I’d been brave enough to realize that as soon as I quit the job that was making me so tremendously ill, I’d immediately find new work that I love. Is the work I’ve found stable? No. But in the meantime I’ll glory in the growth I’ve surrounded myself with and keep leaping and hoping that after each leap, I’ll land gracefully. This entry was posted in Environmental Sensitivities, Green Living, Health and tagged Beauty @ Any Age, Canary, Environmental Sensitivities, Flowers, health, Nature, winter. Bookmark the permalink. Good for you and enjoy yourself! Hope that you get better and better! Thanks, Claudia! No doubt, I’ll keep getting better. That was a very good explanation of being a “canary”. Hopefully people will learn from it! Thanks, Lisa. I hope that people learn from it too. Compared to a lot of canaries, my symptoms are mild so I also hope that people start to become more empathetic toward their fellow humans. Thanks, I’ve found a good clinic to work with me and have been on the mend since Spring of 2013. It’s not easy work but I’m getting there. Better and better every day.